Creating a cool costume or prop out of ordinary materials like fabric and floor mats is incredibly fun. But cosplay is so much more than that. It’s meeting new people, learning new skills and all of this while dressed like your favourite character! The story of how I got into cosplay began many years ago, back in 2003. I was still in school and just discovered that there were conventions (fan gatherings) happening in Germany. I read some articles about it and just loved the idea of dressing up as my favourite characters! As a huge fan of Dragonball I could not wait to get started. Due to my budget limitations I collected only the cheapest materials and protected them like treasures. Then I finally I grabbed the old sewing machine of my grandmother (probably from a time before the great war) and tried to give it my all. I was scared to ruin my precious fabric, but also hyped about creating my very first costume. It was like trying to beat the boss in a video game and losing would erase my save point permanently. Naturally, the machine died half way trough and forced me to finish rest by hand. Just another challenge, but nothing that would stop me working on my costume! I spent a few sleepless nights full with cursing and bloody fingers, but I finished everything in time! Becoming the Great Saiyaman was an incredible feeling and I’ll never forget how much my chest hurt just from being so damn proud. I did it all by myself and didn’t even gave up when my machine left me. Finishing this costume was an incredible boost for my self confidence and taught me that I can accomplish anything if I just believe in myself and give it a shot! My life completely changed after that. And I think this is how everyone starts! You pick a character you like, grab some cheap materials and give it a go. Doesn’t matter how good or bad your costume turns out, if you actually look like the character or not or even if you made the entire costume yourself or bought it. It’s all about having fun. 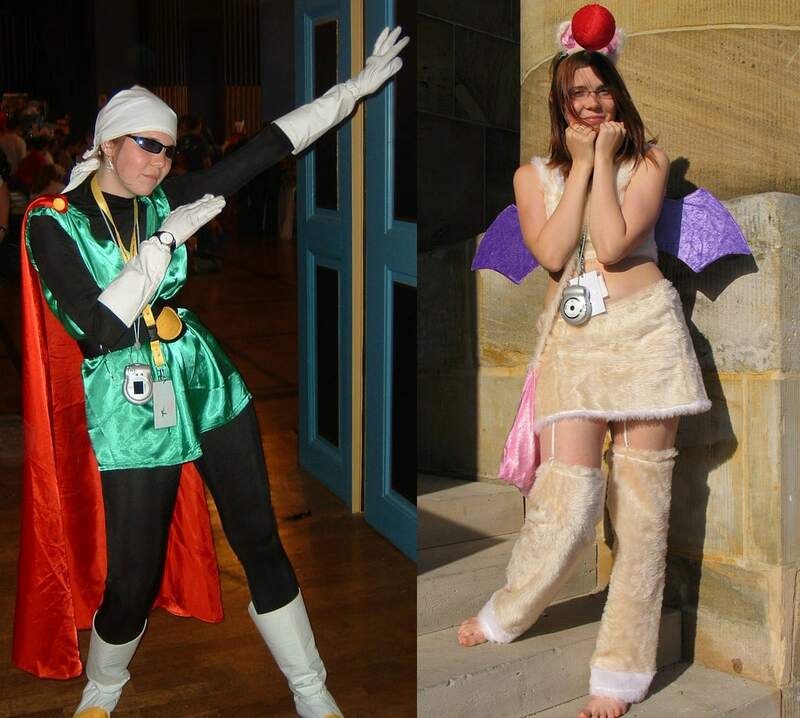 My first cosplays were silly, held together by safety pins and hot glue and I surely didn’t look like the tall, muscular man I tried to portrait – and it didn’t matter. I had a great time, not only walking around in costume amongst similar minded people, but also because I made the entire thing with my own two hands. Cosplay for yourself, create something with your own hands, experiment with new materials and keep in mind it’s okay to fail. Learn to be proud of yourself and most important: Just have fun! “Talent” is just not giving up when you fail. And everyone fails at the beginning. Nobody is born with the talent to create great costumes without practice and endurance. You won’t become a master over night and your first costume won’t look as good as you want, but you’ll improve with ever single project. 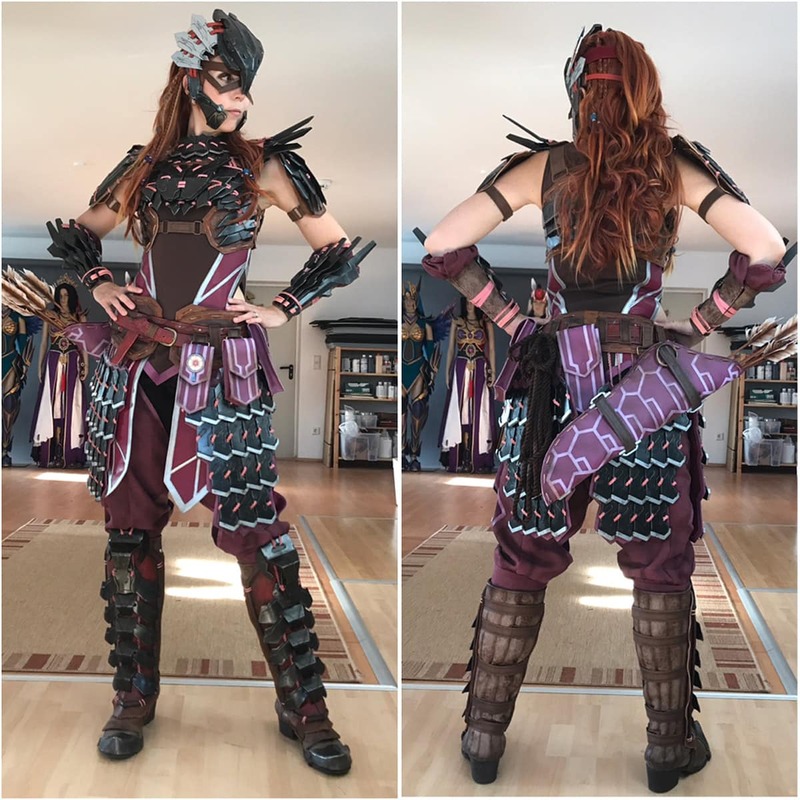 Just compare my Dragonball costume from above to one of my more recent costumes, Aloy from Horizon Zero Dawn. It’s not talent. It’s just years of refusing to give up. As times goes on, your workspace and tool selection will grow as well. I started at the dining table of my families living room, then after moving out for university, I dedicated half of my own room to cosplay before I finally moved to a big workshop together with my husband years later. 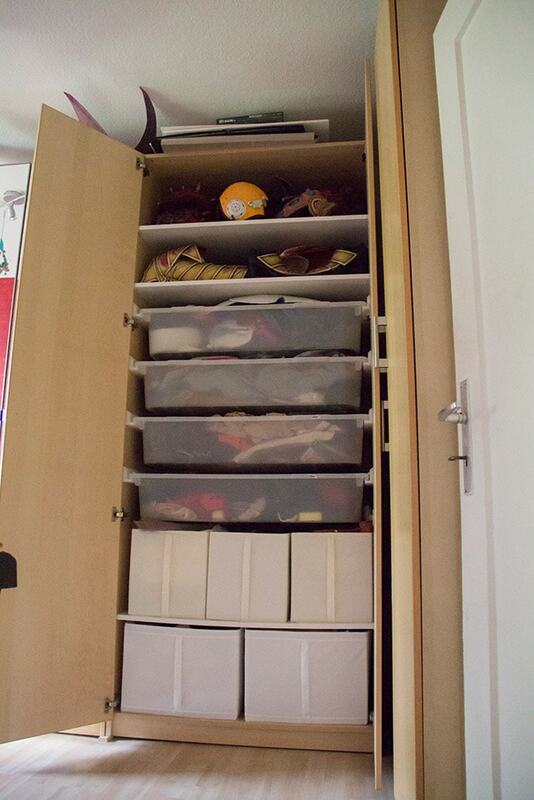 No matter how much space you have, it’s important to keep everything organised. IKEA has a large selection of shelves, boxes, containers and tables that won’t cost you a limb. 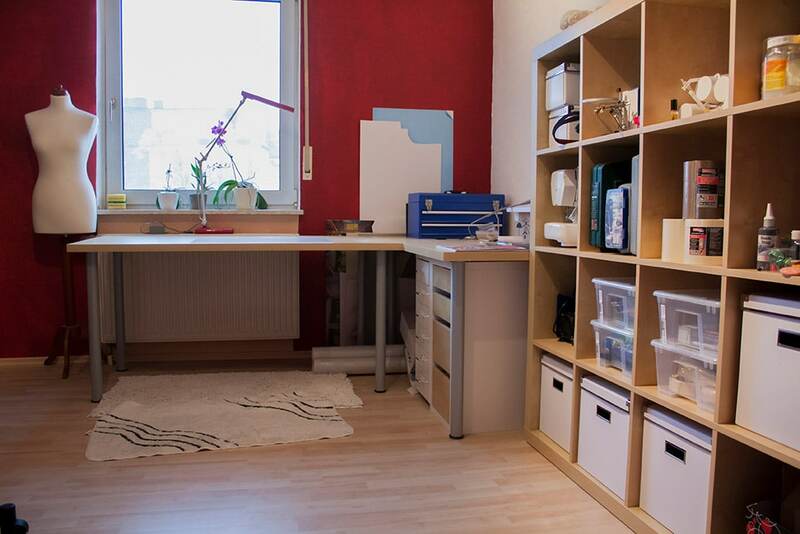 An organised room leaves space for imagination and time you would otherwise need to find things can better be used to actually make things. What tools do you need to begin? Good question! My first ones were scissors, a box cutter, a dremel, a hot glue gun, a hot air gun and a sewing machine. While you’ll have to spent at least around 100$ for a quality sewing machine, all other tools are really affordable and allow you to already craft pretty much everything you want. No need to buy everything at once too. Just grab something here and there once you need it. I actually made a little list of my Top 10 most useful tools for Cosplay, so check out the video if you are curious! Cosplay is not expensive when you do it right! Keep your eyes open and be creative. 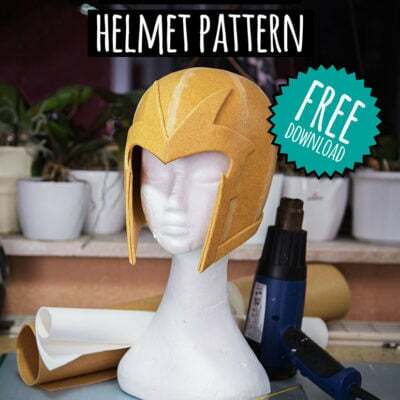 You can make entire armor suits out of cardboard and even EVA foam, one of the most useful and versatile crafting materials doesn’t cost much. 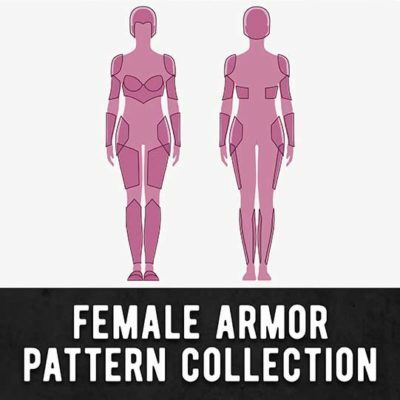 Now, storage might be a little bit tricky – especially if your costume collection starts to grow and you keep falling in love with huge, elaborate armors and props. Again, IKEA comes to the rescue. My favourite solution is using these gigantic PAX closets, which I fill with all kinds of boxes and containers. They might be a bit pricy, but the investment is well worth it. Otherwise you might want to grab a few plastic containers and stack them over each other. Just keep your costumes dry and in the dark, so they keep cool and don’t dust until you wear them the next time! Finally, you don’t need to reinvent the wheel! While trying new things out is fun and educational, it also costs money, time and nerves. 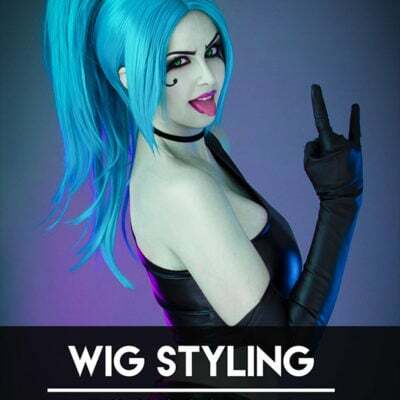 Instead it’s really helpful to check out all the cosplay tutorials the community created over the years. 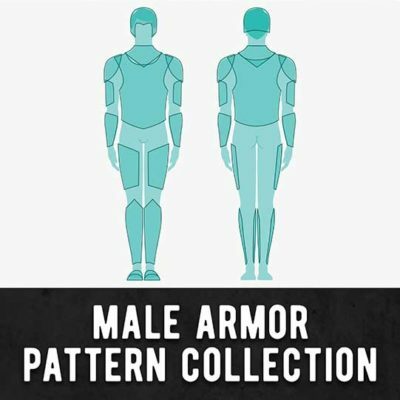 Many of the costumes you want to build have probably already been made by somebody else. If you are lucky, you’ll even find a step by step instruction how he or she made it. My favourite place for tutorials is actually Youtube and the the Google image search. 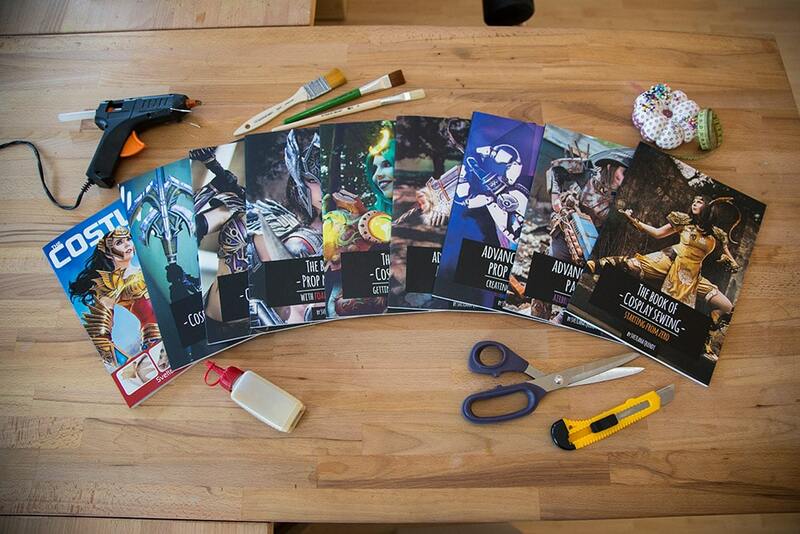 I also really love helping people out and so I put all the knowledge I’ve collected over the years into a series of cosplay crafting books. 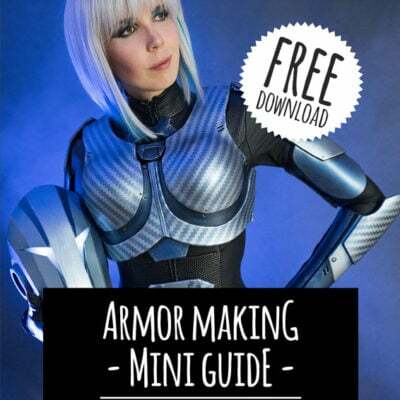 I cover a lot of different topics like sewing, armor making, prop making, installing LEDs, painting and working with EVA foam. This is my way to give something back to the cosplay community, which taught me so many things. Please check out my books if you are curious!